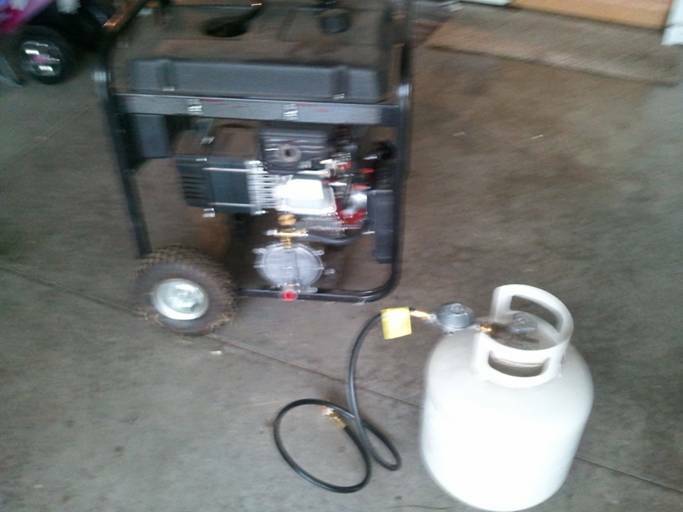 I have a gasoline generator, but I decided I didn't want to store a bunch of gasoline in my garage in the event of a power outage. OK, 5 gallons is good, but in the last emergency 5 gallons was good for a little over half a day. I wanted to run longer before having to get in the BOV and find more gasoline, and without storing a bunch. Here in Central Illinois we worry about snow storms and tornadoes and less about earthquakes, the point being natural gas, while not a certainty, is likely to remain on in most of our emergencies. So, I want a natural gas generator, but they are freaking expensive. After some research I came across this site. 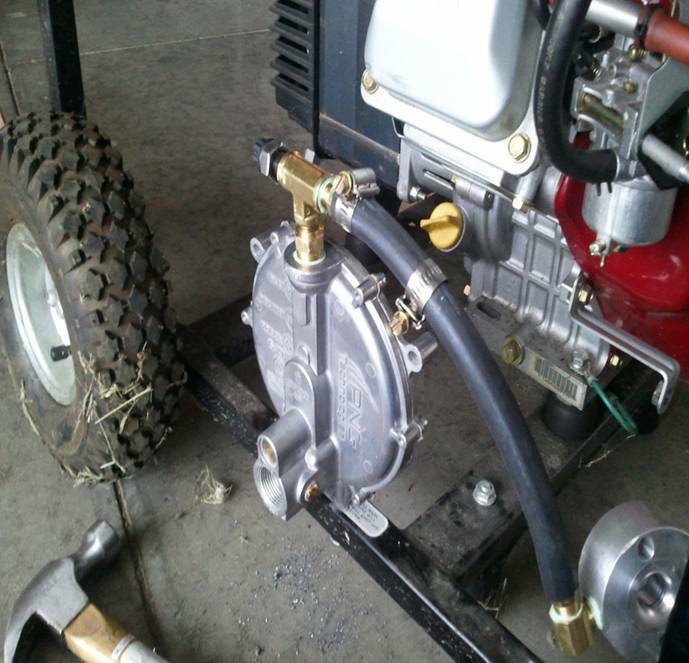 It promised to turn my gasoline generator into a generator that can run on propane or natural gas. So I bought their C kit to test. There is a regulator that take a low pressure gas input then via a hose send the gas to a venturi thing-a-ma-jig that fit between your carburetor and your air filter. Below I have my air-filter housing removed and you are looking at my carburetor with a new gasket and some extensions on the bolts. 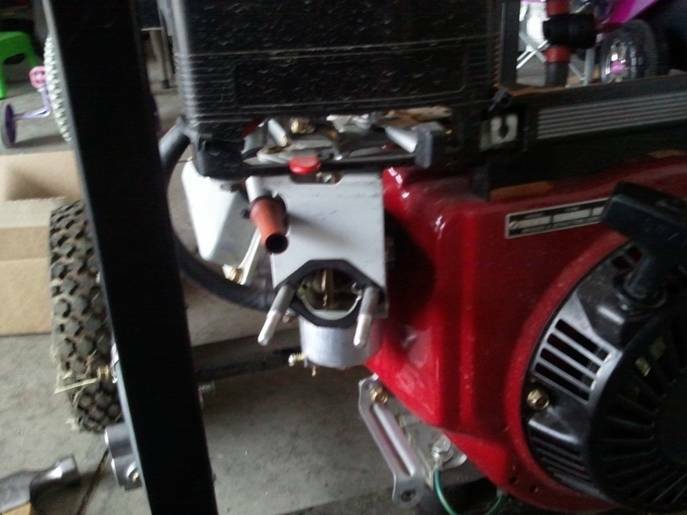 In this next picture you see the regulator I have mounted to my generator frame. You can see a thumb value thingy on top, leading to a hose, and then to the venturi. Next you see the venturi attached to the carburetor. Also note there is an extension piece I had to put on another hose. Next, you see everything put back together. Finally, pardon the image, is the whole setup. For testing it I used a regular propane tank with its own low pressure regulator and hose. I wanted to test with propane before I tore the house up routing gas lines. As you can see assembly was easy. There was no irreversible modifications performed to the generator. The generator should still be able to run on gas just like it did before. Starting the generator was easy. On the back of the regulator there is a little primer button that you push to squirt some gas right into the carburetor. The whole thing came alive on the second pull and was purring with a little adjustment of the thumb valve. I put a load on it (an electric range) and it ran great. I showed all of this to a colleague at work. we went all out and did the conversion on two of his generators and ran gas lines, and did a full test with load as if in an emergency. Everything worked well for him. Next step is to route natural gas to spot outside my home where I plan on setting my generator. Its going to be a few weeks before I get to that. I'll be getting paid for a biiiiiig job on Saturday. 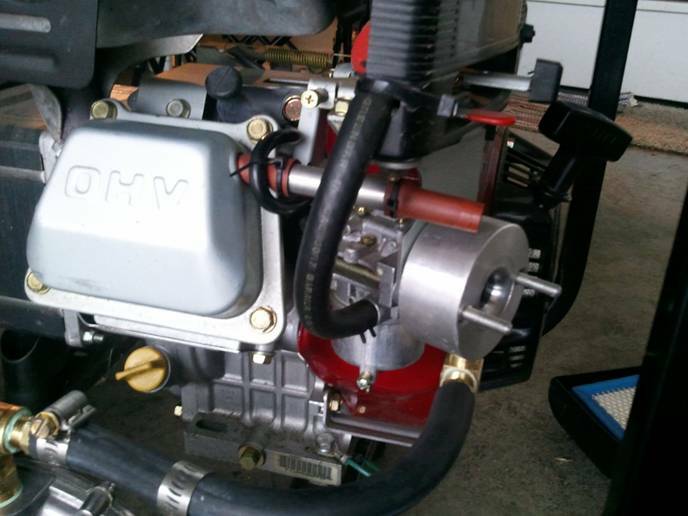 On Monday, I'll be ordering the tri-fuel conversion for my Yamaha EF2400iSHC and then going out and buying two 30lb tanks for propane for it. That should give me around 72 hours of power before the first time I have to find more fuel in the summer and somewhere between 48 and 72 hours in the winter when the outside temperatures are low enough to cause problems with the propane tanks. I'm also hoping that, by questing for propane rather than gasoline in an emergency, I'll be fighting with MANY fewer people for the resource. Hopefully, I'll always be able to find someplace reasonably close to refill my tanks. If I really got screwed, most quick-e-marts have that big cage of propane tanks out front. Much more expensive to do that though. The ability to switch from gasoline to propane at the turn of a switch also means that I can fill the tank and get ~4-5 hours of runtime on gas to give me time to go find more propane in a situation where I HAVE to keep the genny running 24/7. Also, to anyone who's planning on using a generator, you must, must, MUST keep the supplies on hand to do the required periodic maintenance. If you set down with your manual, you'll be SHOCKED how often you need to do basic services in a SHTF-scenario. Running the genny 24/7, I, for instance, will need to change the oil in the genny every day (a little less than a quart). I'll need to change the spark plug and air filter every other day. I'll need to change the fuel filter every 4 days. I'll need to tear down the motor and scrape the carbon out of the cylinder, check the valve lash, adjust the carb, and de-carbonize the exhaust every 12 days. 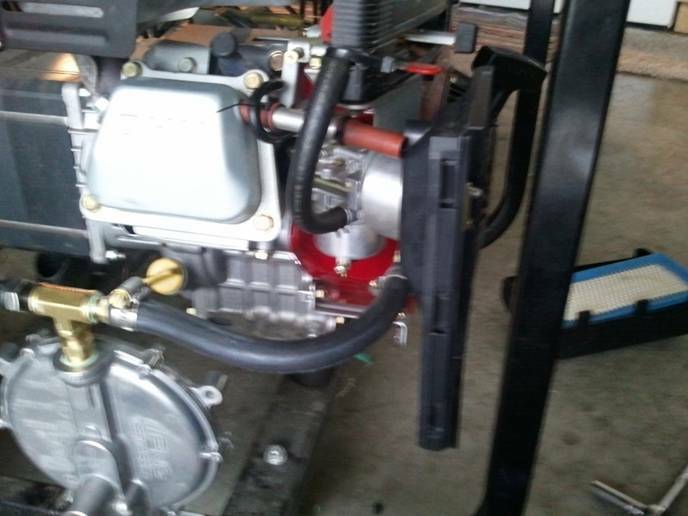 If I go to 2 weeks (look at some of the power outages within the last year around the country, this is reasonably possible), I also have to have everything to tear down and rebuild the top end of the engine, plus plan on having some other source of power for the half day or more it'll take me to do that. williaty.....Let me know how that Yamaha conversion works, I've been looking at converting the EF2400is that I have had for years. FYI- The oil change interval in the manual is 100hr (only the initial is 20hrs) and in cars most propane/natural gas conversions burn so much cleaner that the oil change interval can be doubled. Use synthetic oil and it can go even longer. Estimated time of running on a tank? I wonder if you could get an extension and bolt it on the end of the carb, get another carb and make a dual fuel type setup? Nice, I didn't know they made those kits!! OP, I'd highly recommend securing the generator to the house or some other sturdy structure if it's going outside. My sister had an outside A/C unit stolen from her business about 3 days after it was installed. It was outside of her fence, I can just imagine how easy it'd be for a crook to take a generator. TacAir, No wonder they're so miserable!! Aw Phuch, it's already a dual-fuel generator, in that it's been slightly modified to run on propane and it can still run on gasoline. AwPhuch wrote: Estimated time of running on a tank? These are tri-fuel without hardware changes. Simply put gas in the tank or connect it to LP/NG, turn the respective valve, and start the genny. To switch from prone to NG requires a slight adjustment which requires a tach to watch the idle speed change. It's very trivial to do. According to my research, about 5.7 pounds of CNG is equal to a gallon of gas. Propane is about equal in run time to gasoline by volume. I am an assistant, I assist. Place I had a natural gas powered grill. Cost me about $300 to have an outside line run, with a quick disconnect and shutoff. You could easily pop the line off, hook up the genny line and go. And you also get a BBQ that never runs out of gas. Thanks for the conversion link, great redundancy being able to use my Barbeque propane tanks to cook and power the generator.